Red potatoes. Yellow corn. Green chilies, peppers and cilantro. 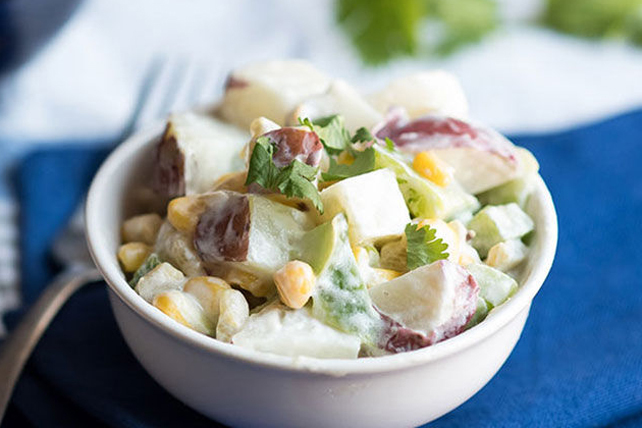 This glorious Southwestern-style potato salad is as lovely to look at as it is good to eat. Mix dressing and cilantro until blended. Add to potato mixture; mix lightly. Refrigerate 3 hours or until chilled. Red-skinned or new potatoes are recommended for use in this salad since they cube neatly after boiling and will readily absorb the dressing.